CactEye is a plugin and set of parts that allow for modular orbital telescopes. 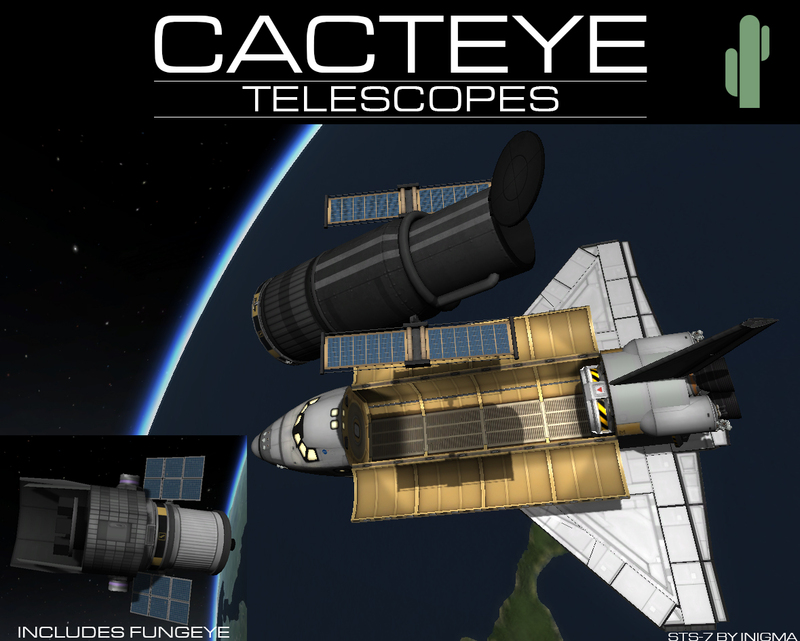 CactEye telescopes feature a fully-functional science system, and is upgradable/serviceable (primarily through Kerbal Inventory System). Orbital telescopes also now become fundamental to discovering asteroids. Unfortunately, Some people on here don't like the forum rules regarding Mod development, leading to Angel 125 dropping this project. This now is open to the community to add to, and work on collectively. In order to keep the mod orderly, We will hold a vote on features, parts, etc. before including anything in an official release. CactEye Telescopes works best with Distant Object Enhancement by MOARdv. "Cacteye Telescopes Community Takeover" is a derivative work of "CactEye Telescopes Continued" by Angel 125, which is a derivative work of "CactEye 2" by Raven, which is a derivative work of "CactEye Orbital Telescope" by Rubber-Ducky. It is licensed under CC BY 4.0. Dres science bug fixed finally, again! 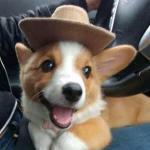 Congrats on taking over this mod! One quick question. How exactly do I accumulate science in career mode with this? I've launched the FungEye with a camera 2 module and tried pointed it at a all the planets (I'm using DOE) but no science button or anything. There's also no right click menu on the Camera modules. The only modules that have right click menus are the asteroid scanning modules, to scan for asteroids. Can you add the skybox to the background like what JPLRepo did with the Tarsier Space Telescopes mod? So... Does a switching of hands account for the version number going from 2.7.2.0 to 1.1.2.2? Because that's darned confusing. This mod was designed to actually remove the skybox as you focus in. When observing bright objects such as planets, the telescope's exposure time is to little to gather enough light to view anything dim, like stars, in the background. There are plans to add deep space processors and a new telescope frame for them. Ones for nebulae and one for DSOs like galaxies and clusters. I'm working on how the best way to implement those at the moment. To gain science with this mod, once in orbit, right click on the telescope part itself, not the processors and click show GUI. A window will appear that shows you the view from the telescope. On the bottom of the window is a slider that allows you to zoom in and there is one that controls the gyro sensitivity if you have the advanced gyro on the craft. Select a planet as a target and zoom and control the attitude to keep the planet in view so that it is fairly large and visible in the camera view. On the bottom of the camera view are 2 buttons, the left one takes a picture to do the science, the right one takes a screen shot from the camera. One you click the do science one, a standard science window will pop up, it's usually behind the main window. I'm working on a better main window for future releases. Yes, and the version before that was very different as well. I chose to go with the KSPVerson.Build for formatting since the last 2 already had different versioning systems. They will remain in this pattern as long as I have it. Ah! I didn't have the 'target' set as a target, hence the buttons didn't show up on the GUI. @icedown, Is there at all any possibility to get the cacteye mechanics working with the telescopes from TST? I'd like to have more telescopes, but prefer to have the cacteye eva repair and other mechanics from cacteyeas opposed to the TST ones. I'll have to actually play with TST before I can answer that. I've only looked at the 2mm video so I don't know anything about them operationally at the moment. I will look into it though. I know in the previous thread that the guys that make TST said they were doing a rewrite but I don't know if that has been completed yet or not. Perfect. Look, if there are any "need to-dos" still for cacteye, get that done first. I was just suggesting it. I'm more than happy using this without TST. One thing I'm working on right now is the addition of the deep space telescope(s). I'm looking at a couple different implementations. One would be a point and shoot similar to the current interface. Targets will possibly be things that appear on the skybox, but "enhanced" by the telescope. As with the other telescopes, more science will come from more advanced processors and the more advanced processors will have more valid targets. These targets however, not be targetable by any part of the system and finding them will be a search on your own with no targeting assistance. Second idea. The telescopes would be orbital scanners and function similar in operation to ScanSat systems. Once in a specified orbit and activated, these will slowly but constantly generate science over time. The maximum science generated will be determined by selected orbit and body orbited. Only one processor will be able to be installed on these telescopes at a time and multiple telescopes in an orbit will increase rate of science generation, but not total science obtainable. Since these telescopes will be big, heavy, and expensive, multiple telescopes will hopefully not really be feasible. Third idea. Combination of 1 & 2. Targets available and telescope has to be pointed manually. However targets will have general directional information available. 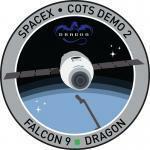 The available targets depends on the amount of time in orbit. Higher tier processors will generate targets faster. Target generation will take place in background, not just when telescope is active. Larger amounts of science will be available but will require work on the part of the user. When using manual pointing, target must be held within view for a certain amount of time for maximum science. Ability to store science for transport to research labs or return to Kerbin, system may be similar or possibly compatible with TST. Other ideas will be considered. These are just the ones I came up with while brainstorming. Not to basically be asking the wrong person, but I'm gonna ask it anyway. Is there any chance that support for researchBodies will exist with these telescopes, I'm just curious as I thought that was a goal at one point of one of the hands on the mod. researchBodies is a really cool system that I've been enjoying, and if it was as simple as dropping the TB-75M telescope module in then I'm sure it could be added without messing with too much of the extra features of either mod, but I think that's the main goal of the compatibility with TST. It is possible. I will look into it. I haven't looked at the mod before now so it will take me a little to figure it out and if it can be integrated. Do I need to repost that weird EVE issue here or is it unfixable for now? It is what I'm currently working on. It is an issue with the cameras being configured incorrectly. I haven't dealt with them before so it may take me a while to sort this one out. @icedown People have already mentioned TST and Research Bodies, which are both run by @JPLRepo. I asked him awhile back about support for CactEye in Research Bodies and he said basically, well you can read his response here. Keep in mind he's literally just started working on ResearchBodies, and has a lot of plans for that mod. Once things settle down with CactEye a bit, and he makes some head way with ResearchBodies, I recommend having a chat with him (if he doesn't show up here first). It would be a great to pursue compatibility at some point in the future. p.s. Congrats on the promotion. @Deimos Rast I'm already in contact with JPLRepo. He's going to keep me advised on the progress on his side. I'm going to leave the cameras alone for a little. Can't seem to figure out what's wrong with them so I'll come back to them later. If anyone has experience with them, any help would be greatly appreciated. For now I'm going to work on overhauling the science system. As of current when you point at a planet and do the science, it registers as the science is done from that planet. This breaks the contract system by making it think that you've been to that planet causing contracts to show up for a body you may not even be able to make it to yet. I'm going to rework it so that it creates the science based on the primary planet you are orbiting. This means that you won't be able to get more science just by placing the telescope in the orbit of moon. Thoughts and suggestions are welcome. I am glad to see that you are working on this and good luck with the camera issues! I have an idea and I guess a request. There are big differences in the technology that make up many of the orbital observatories that have been launched throughout the years. As part of the interchangeability of the mod parts, how hard would it be to add different types of telescopes? What I mean is this...could it be made where different types of telescopes are used based on technology. The way it has worked in our history is that we went from Orbital Ultraviolet Telescopes to Infrared to Microwave to Hubble. More and different telescopes are in my plans. Adding more processors and defining what processors can go to which scope are also something I'm looking into. My priorities right now are getting the getting the cameras and science working better. The main issue preventing addition of processors is the science problem right now. Once I get the current ones working as they need to be, expanding them will be much easier. Of course there's always the problem of my modeling capabilities ( I can make a grey 1m cube sat in blender....) but getting things brought up to current standards is my priority at the moment. I had offered my services as an artist to @Andem previously when he had taken over the mod. Considering that my main project is a giant, amorphous, never-ending blob, it wouldn't be too much for me to set it down occasionally and whip some more parts here and there. I rather enjoyed CactEye back when I played and wouldn't be opposed to seeing it grow, rather than just maintained. I didn't know you were working on Kerbin I will never be quoted saying I don't need modeling help. In keeping with my current theme of bringing things up to date, a remake of the current models would be my request at the moment. While they are nice and were stock alike initially, they are dated and bland by current standards. Updated models for these would be the first step towards the new telescopes. This build moves all science into high Kerbin orbit. This should stop the breakage of the contract and progression systems by simply taking a picture. This is NOT compatible with OPM or RSS. Once I verify that this is working as intended, I'll update those configs. I will take a look at importing the existing models, to make sure I don't mess with the node placements at all.